Gun owners with children younger than 18 in the household are more likely than those who aren’t parents to say they keep all their guns locked and unloaded while they’re at home, according to a new Pew Research Center survey. Even so, 44% of gun-owning parents say there is a gun that is both loaded and easily accessible to them all or most of the time when they’re at home. Among gun-owning parents with children in their household, 54% say all of the guns in their home are kept in a locked place and 53% say they are all kept unloaded. By comparison, 30% of gun owners who are not parents say all their guns are locked and 40% say they are unloaded, according to the survey conducted in March and April among 3,930 U.S. adults, including 1,269 gun owners. Gun owners with children are also less likely than those without children to have an easily accessible gun in the home: 44% say there is a loaded gun that is easily accessible to them all or most of the time when they are home, compared with 59% of non-parents. Regardless of how their guns are stored, the large majority of gun-owning parents say they have talked with their children about gun safety (82%). A smaller share of parents who don’t own guns say the same (51%). Among non-gun owners, mothers are much more likely than fathers to say they have talked with their children about gun safety (58% vs. 37%). 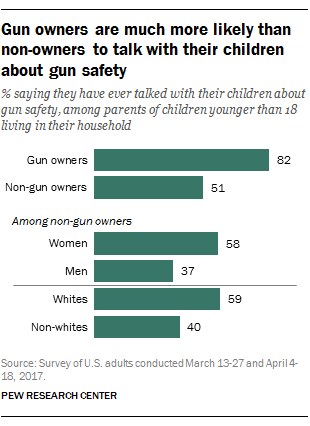 And while 59% of white parents who don’t own guns say they have talked with their children about gun safety, 40% of nonwhite parents who don’t own guns say they have done this. Americans overall say keeping guns unloaded and in a locked place and storing guns and ammunition separately are more important when there are children in the home than when there are no children in the home. The pattern is similar among parents and non-parents and among gun owners and non-owners, though non-owners are consistently more likely than owners to say each is essential for owners with or without children. When it comes to taking gun safety courses and keeping shooting skills up to date, Americans don’t distinguish between households with and without children when considering how important these safety measures are. For example, similar shares say it’s essential for gun owners with children in the home and those with no children to take gun safety courses (73% and 68%, respectively).